Russian manned lunar habitat. Study 1973. Laboratory-living module. Three story lunar surface residence and laboratory for Vulkan-launched Lunar Expedition. AKA: Laboratorno-zhiloy modul';Vulkan-launched version. Status: Study 1973. Payload: 6,300 kg (13,800 lb). Gross mass: 21,500 kg (47,300 lb). Height: 9.70 m (31.80 ft). Atop the landing stage was a four-lobed first story. 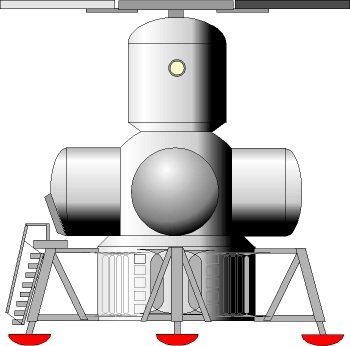 Clockwise from the landing leg with the ladder to the surface, this consisted of cylindrical chambers containing: the airlock; crew washroom and kitchen; sample storage area; and control room. At the junction of the four cylinders was the crew dining and meeting table. Atop this was a two storied cylinder. On the lower story was the laboratory; atop this was the crew quarters. Total floor space devoted to work activities was 25 square meters, with 35 square meters devoted to crew quarters. The LLM would have been braked close to the lunar surface with the Block R stage, the descent stage itself only performing final descent and landing maneuvers. The crew would land in an LEK near the LLM and take up residence in it for up to a year. Crew Size: 3. Habitable Volume: 160.00 m3. Electric System: 8.00 average kW. Family: Lunar Habitats, Moon. Country: Russia. Spacecraft: LEK Lunar Expeditionary Complex. Launch Vehicles: Energia, Vulkan. Agency: Korolev bureau. Bibliography: 367, 89.